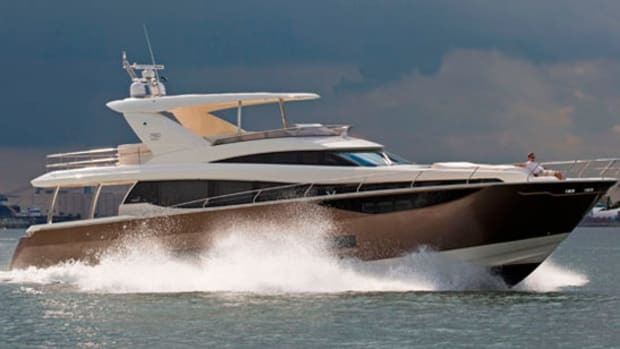 With its new 750, Ferretti found a way to mesh luxury, performance, and good looks in a package that delights. 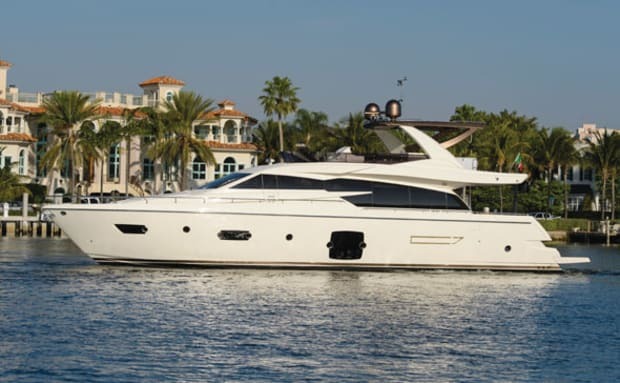 The day after I tested the new Ferretti 750 off of Ft. Lauderdale, I was talking to a boat-industry friend some 45 miles away in Palm Beach, and mentioned the test. He piped up right away, “Oh I saw you! That was you passing under the 17th Street Bridge.” I was surprised, and a little incredulous. 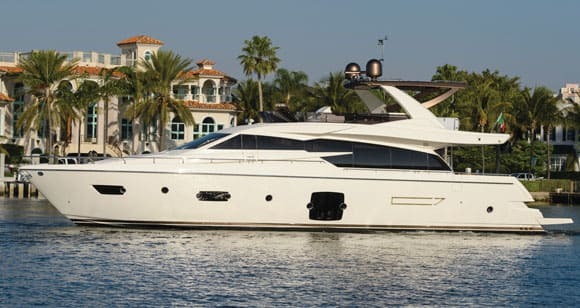 Florida after all is a big place, and Lauderdale of course is crawling with the largest and ritziest yachts imaginable. “You sure it was the 750?” I asked, squinting into the bright Palm Beach sun. And holds the eye. 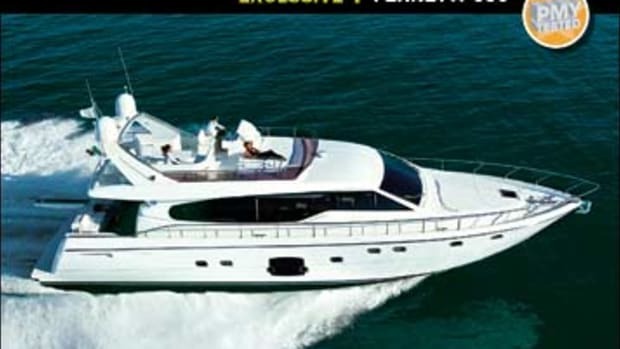 What my friend meant, I’d wager, is that the 750 looks like no other Ferretti before her. She’s the first product of a planned overhaul of Ferretti’s exterior lines, which aims at making the boats sleeker, with brighter interiors. Ferretti’s design group, Studio Zuccon, is achieving this end by lengthening and enlarging the exterior windows. The result is a boat that effectively looks like she has a low profile, despite having a truly large flying bridge and hardtop above. Additionally, the hardtop on my test boat was painted bronze to break up the boat’s profile, thus helping the 750 avoid that ever-so-unfortunate but all-too-common floating-condominium aesthetic. At the same time, the effect of those windows in the saloon is, well, pretty much exactly what Ferretti had hoped for. Natural light inside is nearly blinding. (Thank goodness for shades.) And the space itself, while no doubt large in its own right, feels like it belongs on a boat at least 10 feet longer. 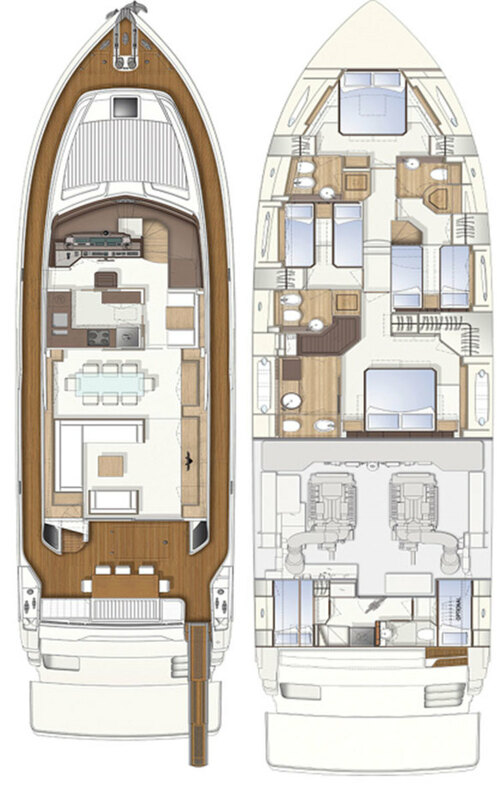 A major factor in the main deck’s airy ambiance on my test boat was the decision to make the galley—forward of the saloon and up one step—open. 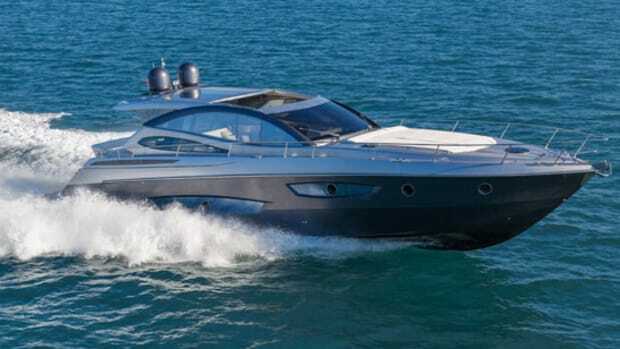 Optionally, it can either be enclosed in frosted glass, or placed below, a configuration Ferretti expects will be popular in South America, but probably not in the U.S. Forward of the master there are mirroring en suite guest cabins to port and starboard, each with twin berths and enough walkaround space to make them more than palatable for all but your pickiest guests. An en suite, forepeak VIP with notable amounts of natural light rounds out the deck nicely. 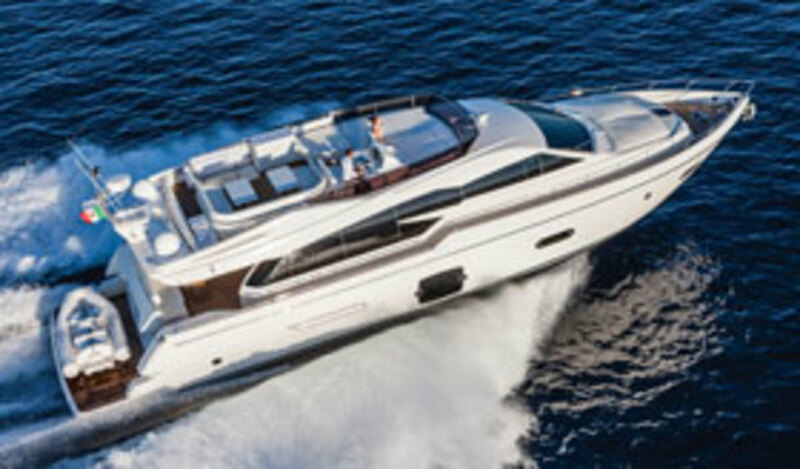 But it’s not just the people onboard the Ferretti 750 that get a nice, big place to call their own—the powerplants have it pretty good too. The vessel’s engine room should leave any owner or captain happy to be aboard. Headroom there was high enough for me (at 6 feet tall) to walk upright comfortably. And access was clearly of paramount concern. It’s easy to get a hand on just about anything you’d want to reach—the 23-kW Cummins Onan generators to starboard and port, for example—and features like four Racor fuel-water separators and a large Fireboy fire extinguisher situated forward should help keep everyone’s mind at ease. A large soft patch overhead would allow a future owner to change out the engines without damaging his boat; a smart detail that adds to resale value. All of this is to say, the 1,321-horsepower MTUs are housed quite comfortably, and they thank you for it in spades, as I would find out shortly. 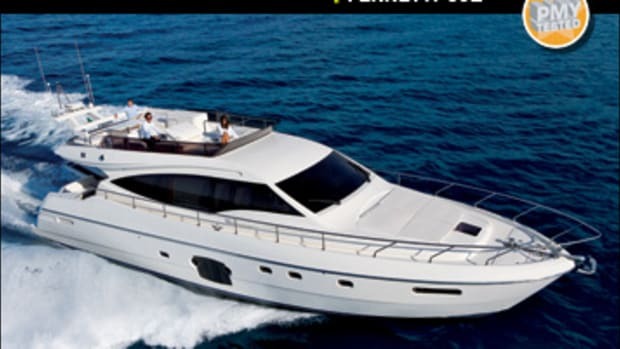 Out on the water the Ferretti 750 was a pleasant surprise. You could be forgiven if upon first glance you thought this boat might be at its finest while firmly anchored in some secluded cove. But you’d be wrong. She can move. Top speed was a spritely 31 knots, and she cruised comfortably just slightly below that at about 29. And the ZF electronic steering offered confidence-inspiring grip at speed. What’s more, her solid, vinylester-resin laminated hull—she’s foam-cored above the waterline for weight considerations—sliced cleanly through ugly 4- and 5-foot seas that I know for a fact would have scared some other manufacturers back into the shelter of the ICW to do speed runs. That’s not something you see everyday from a flying-bridge cruiser. Hardover she turned a bit broader than I’d prefer, making circles in about four boat lengths, but that’s not necessarily bad considering it means people on the flying bridge won’t get tossed around during hard or abrupt turns. She was also notable for her quiet ride. My sound meter at the lower helm never budged above 78 dB(A), even at WOT, and cruise speeds saw an even more manageable 76 dB(A). Sightlines from both the upper and lower helms were clear. They were particularly impressive from the lower helm, where those large saloon windows, and a two-piece windshield with center mullion made for great views, a feature that was aided by an admirable lack of heel even during hard turns. On the way back in, we stopped in a notoriously swift-running stretch of the ICW for slow-speed maneuvers. 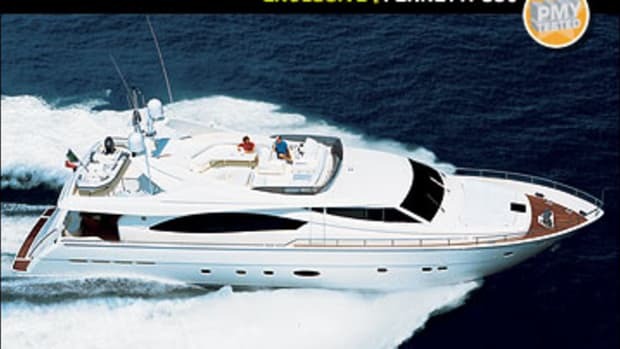 There I spun the boat like a top, and backed her down and walked her side to side even in a strong current thanks to 24-volt Side-Power bow and stern thrusters. To have a boat in such conditions—any boat, let alone during a sea trial—can be harrowing, but I never once felt like we were in danger of drifting astray, and that’s saying something. 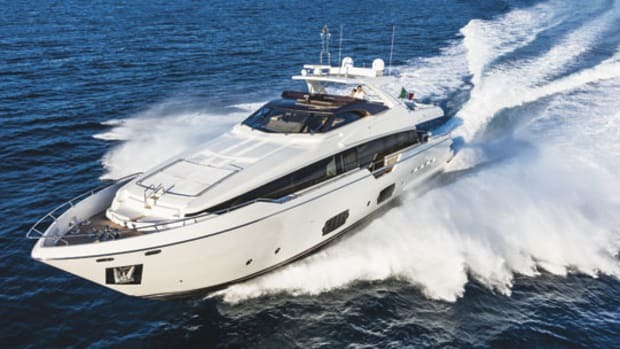 Afterwards, in somewhat less harrowing confines, that is, Ferretti’s one-of-a-kind, waterfront, American headquarters, I spoke to the company’s brand manager, Alessandro Diomedi, about what makes the 750 special as we toured the boat. Good points all. 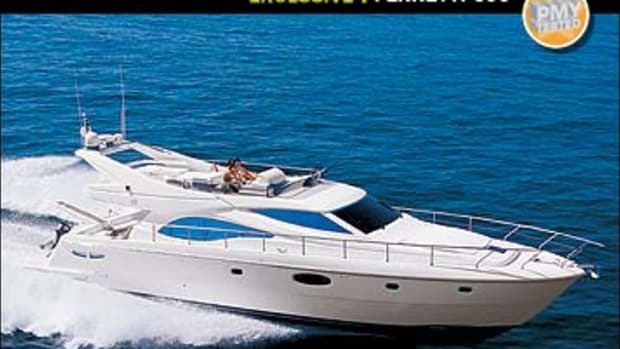 And that’s probably because Ferretti has had plenty of practice with this size and type of boat. 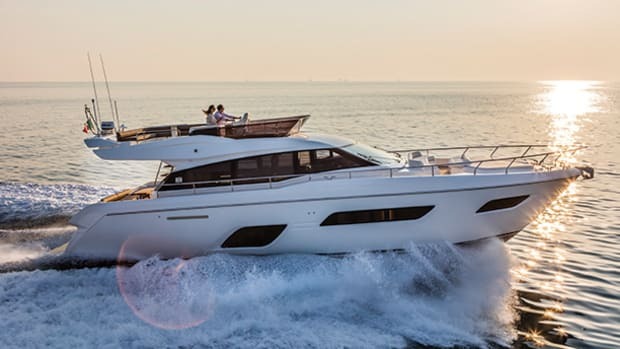 The 750 is an evolution of the company’s 720, the major differences being those aforementioned sleek looks, the option for a hardtop, Bimini, or roll bar, and a hydraulic swim platform that can hold up to 1,000 pounds (see “Better Boat: Tender Spots,” above). Which brings me back to my original point. There’s so much to like onboard the 750, and such a surprisingly seakindly and sporty ride to boot, that despite her striking and forward-looking aesthetical improvements, there’s a whole lot more here than meets the eye. 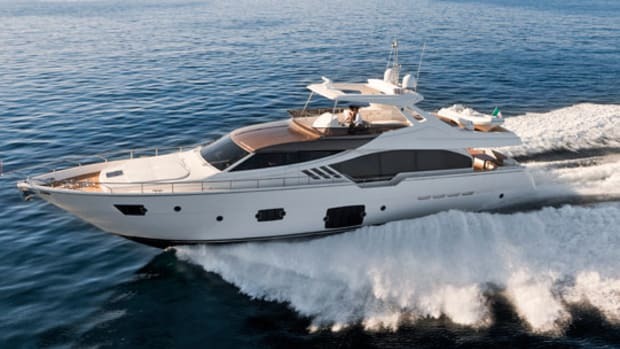 And that should be a boon for Ferretti owners for years to come. 900 gal. fuel, 60 gal. water, 4 persons, 200 lb. gear. 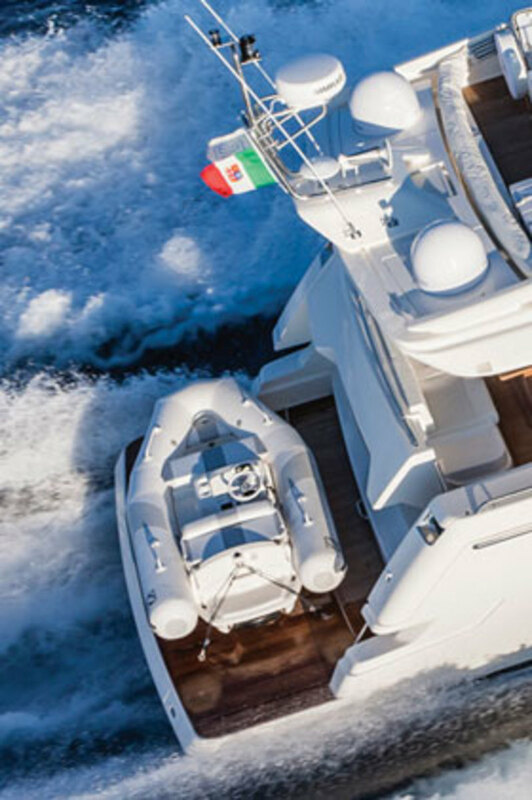 This article originally appeared in the July 2014 issue of Power & Motoryacht magazine.